Paella arancini. A savvy and sassy little appetizer that’s inspired by classic Italian arancini but tastes contemporary as heck. 1. Heat the oil in a 10-inch (25-cm) paella pan, a large wok, or a wide Dutch oven and cook the garlic over low heat for 5 minutes until softened. Add the tomato, paprika, and a little salt and black pepper, and cook for 5 minutes. Stir in the prawns or shrimp, then the rice. Add the stock, bring to the boil and simmer gently for about 20 minutes over low heat, until the rice is al dente and the stock absorbed. Let cool to room temperature and then cover and refrigerate the paella for 1 hour. 2. Meanwhile, gently fry the almonds and hazelnuts in a large saucepan with 2 tablespoons of the oil over medium heat until golden, then remove with a slotted spoon. Add the garlic to the pan and cook until soft, about 2 minutes. Then add the tomato to the pan and cook for 5 minutes more. Transfer the tomato mixture to a blender or food processor, add the nuts, bread and red pepper, and blend until smooth, about 30 seconds. With the blender still running, gradually add the remaining 3 tablespoons oil and the vinegar until a smooth sauce forms. Add the Espelette or cayenne pepper and salt to taste. 3. Beat 1 egg and work it into the chilled rice mixture until combined. Shape into 20 balls about the size of golf balls. 4. Beat the other 2 eggs in a shallow dish. Place the flour and breadcrumbs in separate small bowls. Dust each ball lightly with flour, dip into the egg and then coat with breadcrumbs. 5. Pour enough sunflower oil in a wok or saucepan to measure about 2 inches (5 cm) in depth. Heat it until a cube of bread added to the oil crisps in 20 seconds, then add the arancini in batches of 5 or 6 at a time. Fry the arancini, turning them occasionally, until golden brown, 4 to 5 minutes. Drain on paper towels or a brown paper bag. Place on a warmed serving dish. Repeat with the remaining arancini. 6. Serve the paella arancini as soon as possible with the romesco sauce in a dish on the side. Espelette pepper is a type of pepper grown in Espelette in the Basque region of southwest France. It’s particularly mild with a hint of smoke and sweetness and it’s pretty much replaced black pepper in Basque cooking. You can use a small pinch of cayenne instead. 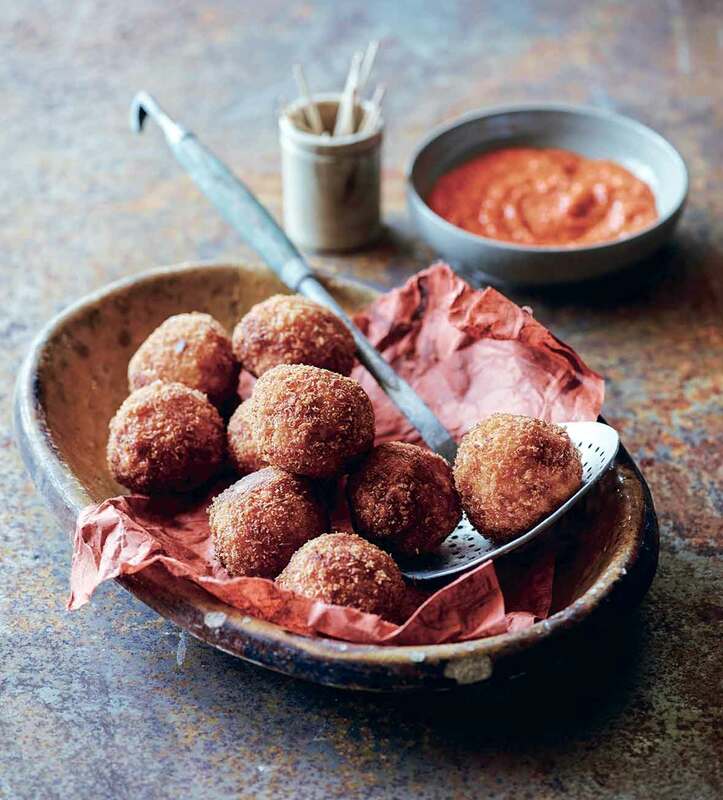 Paella Arancini Recipe © 2015 Louise Pickford. Photo © 2015 Ian Wallace. All rights reserved. All recipes and photos used with permission of the publisher. These paella arancini are fantastic! Crispy crunchy exterior with a creamy interior. What's not to love? I served these as part of a tapas meal with a lovely Rioja and they were a hit. Don't skip the romesco sauce as it really enhances the flavors of the paella. 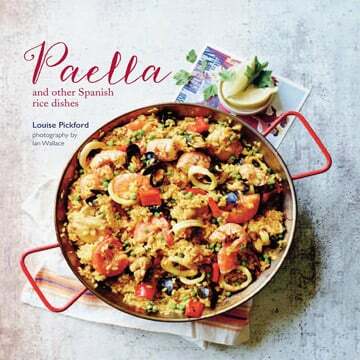 I used Arborio rice which was great as it resulted in a really creamy paella. We ate these paella arancini while watching the Super Bowl. They’re a great appetizer and everyone loved them. Although the sauce wasn’t difficult to make, it was a little involved with frying the nuts, garlic and tomato, then whirling it up. My recommendation would be to serve these with cocktail sauce. I put a bottle of it on the serving table beside the romesco and the cocktail sauce definitely won out. It helps to shape all the balls at once, clean up, and then you can have a dry hand and a wet hand while breading. I used a small pinch of cayenne pepper in place of the Espelette pepper.